Joe Pass (born Joseph Anthony Jacobi Passalacqua) (January 13, 1929 – May 23, 1994) was a jazz guitarist. His extensive use of walking basslines, melodic counterpoint during improvisation, use of a chord-melody style of play and outstanding knowledge of chord inversions and progressions opened up new possibilities for jazz guitar and had a profound influence on future guitarists. 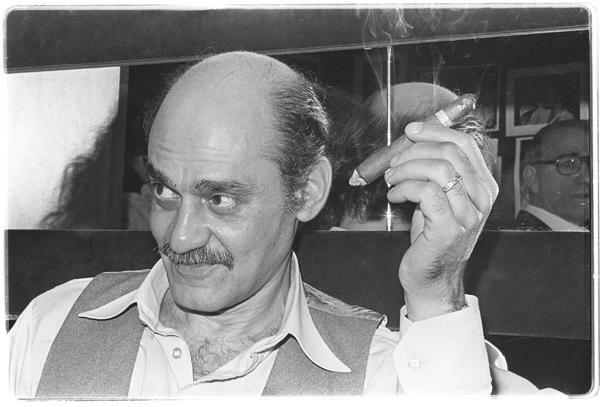 Born in New Brunswick, New Jersey, Joe Pass, the son of Mariano Passalacqua, a Siciliyan-born steel mill worker, was raised in Johnstown, Pennsylvania. Born into a non-musical family, Pass started to play the guitar after being inspired by actor Gene Autry’s portrayal of a guitar playing cowboy. He received his first guitar, a Harmony model bought for $17, on his 9th birthday. Pass’ father recognized early that his son had “a little something happening” and pushed him constantly to pick up tunes by ear, play pieces not written specifically for the instrument, practice scales and not to “leave any spaces” – that is, to fill in the sonic space between the notes of the melody. As early as 14, Pass started getting gigs and was playing with bands fronted by Tony Pastor and Charlie Barnet, honing his guitar skills and learning the music business. He began traveling with small jazz groups and eventually moved from Pennsylvania to New York City. In a few years, he fell victim to drugabuse, and spent much of the 1950s in relative obscurity. Pass managed to emerge from it through a two-and-a-half-year stay at Synanon, drug rehabilitation program. During that time he played guitar non stop and further honed his skills. In 1962 he recorded The Sounds of Synanon. 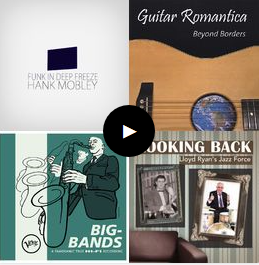 Pass recorded a series of albums during the 1960s for the Pacific Jazz label, including the early classics Catch Me, 12-String Guitar, For Django, andSimplicity. In 1963, Pass received Downbeat magazine’s “New Star Award”. Pass was also featured on Pacific Jazz recordings by Gerald Wilson, Bud Shank, and Les McCann. Pass toured with George Shearingin 1965. Mostly, however, during the 1960s he did TV and recording session work in Los Angeles. He was a sideman with Louis Bellson, Frank Sinatra, Sarah Vaughan, Joe Williams, Della Reese, Johnny Mathis, and worked on TV shows including The Tonight Show Starring Johnny Carson, The Merv Griffin Show, The Steve Allen Show, and others. In the early 1970s, Pass and guitarist Herb Ellis were performing together regularly at Donte’s jazz club in Los Angeles. This collaboration led to Pass and Ellis recording the very first album on the new Concord Jazz label, entitled simply Jazz/Concord (#CJS-1), along with bassist Ray Brown and drummer Jake Hanna. In the early 1970s, Pass also collaborated on a series of music books, and his Joe Pass Guitar Style (written with Bill Thrasher) is considered a leading improvisation textbook for students of jazz. Norman Granz, the producer of Jazz at the Philharmonic and the founder of Verve Records signed Pass to Granz’s new Pablo Records label in 1970. In 1974, Pass released his landmark solo album Virtuoso on Pablo Records. Also in 1974, Pablo Records released the album The Trio featuring Pass, Oscar Peterson, and Niels-Henning Ørsted Pedersen. At the Grammy Awards of 1975, The Trio won the Grammy Award for Best Jazz Performance by a Group. As part of the Pablo Records “stable,” Pass also recorded with Benny Carter, Milt Jackson, Herb Ellis, Zoot Sims, Duke Ellington, Dizzy Gillespie, Ella Fitzgerald, Count Basie, and others. Pass and Ella Fitzgerald recorded six albums together on Pablo Records, toward the end of Fitzgerald’s career: Take Love Easy (1973), Fitzgerald and Pass… Again (1976), “Hamburg Duets – 1976” (1976), “Sophisticated Lady” (1975, 1983), Speak Love (1983), and Easy Living (1986). 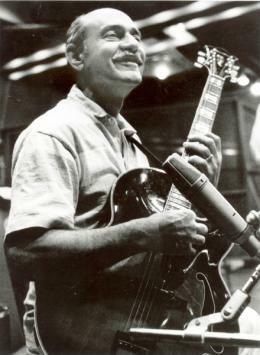 In 1994, Joe Pass died from liver cancer in Los Angeles, California at the age of 65. In addition to his ensemble performances, the jazz community regards Joe Pass as an influential solo guitarist. His solo style was marked by an advanced linear technique, sophisticated harmonic sense, counterpoint between improvised lead lines, bass figures and chords, spontaneous modulations, and transitions from fast tempos to rubato passages. He would regularly add what he called “color tones” to his compositions, to give what he believed was a more sophisticated and “funkier” sound. As common in jazz, he would achieve this by taking the basic chord, for example G7 and would improvise or substitute certain notes, so would play for example a G13 chord or would add other tones such as flat or sharpened 5ths and 9ths to the chord. He would then often connect them chromatically using his walking baseline of root notes. Pass’s early style (influenced by guitarist Django Reinhardt and saxophonist Charlie Parker), was marked by fast single-note lines and a flowing melodic sense. Pass had the unusual lifelong habit of breaking his guitar picks and playing only with the smaller part. As Pass made the transition from ensemble to solo guitar performance, he preferred to abandon the pick altogether, and play fingerstyle. He found this enabled him to execute his harmonic concepts more effectively. His series of solo albums,Virtuoso (volumes 1 through 4) are a demonstration of Pass’s refined technique. Joe Pass let some instrument manufacturers use his name, but he only used those instruments to fulfill its engagement against those brands, or as travelling ones. He really used to play a Gibson ES-175 guitar (mainly) and a guitar made for him by master crafter Jimmy D’Aquisto. Epiphone has produced an edition of the Emperor line ofsemi-acoustic Guitar in his honour. Previously Ibanez had a Joe Pass model jazz guitar, as they continue to for influential jazz guitarists George Benson and Pat Metheny.